At Olive Oil Lovers we greatly value the relationships with the producers whose oils we feature on our site and visit their estates whenever possible. The following is a travelogue from a visit to the estate of Olio Guglielmi during the olive harvest season as part of our Producer Feature series. The coastal southern region of Puglia, otherwise known as the heal of Italy’s boot, is not only a region of sunny beaches and crystal blue seas, but also one of rolling fertile hills where agriculture predominates and accounts for nearly 70% of jobs in the region. Along with the region’s principle productions of wheat and wine is the cultivation of olives, and is an area that produces more oil than any other region in Italy. Of the many olive oil producers in the region, one whom we admire and whose oils we adore is Olio Guglielmi, located in the small village of Andria. We were lucky enough to visit this producer at the peak of production season and see for ourselves the company who has been cultivating the area’s rich soil and harnessing its plentiful sunshine for more than 60 years. Arriving into the town of Andria, about a 40 minute drive up the coast from Bari, we are greeted by our host, Saverio Guglielmi, outside the entrance of their mill located in the center of town (the company has since moved their mill to a larger facility outside of town). After a peaking around the mill, which is relatively quiet and empty as it awaits the arrival of the day’s harvest, we decide to head out into the countryside to observe the harvest in action. 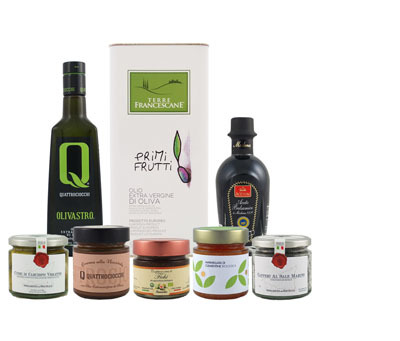 Olio Guglielmi cultivates three main local varieties: the powerfully pungent Coratina, an oil rich in polyphenols, antioxidants and vitamin E, as well as the mild and fruity Peranzana and the grassy Ogliarola. They are also one of just a handful of olive oil producers in Puglia who also practice organic farming and sustainability throughout all stages of production. The journey by car to the olive grove is one past acres of various agricultural crops: field after field of green fennel, beans, chicory and fruit trees. It appears a different kind of food is growing in every direction that one can’t wait to taste its bounties. Upon arrival at the olive grove, across from a sprawling field of fennel, we are welcomed by the smiling Riccardo Guglielmi, one of two brothers who have been running the daily operations of the company since 1954. Riccardo proudly shows us his Coratina trees, loaded with olives colored to the perfect stage of ripeness – bright green just beginning to turn purple. He breaks off a branch from one of the trees to proudly display the tree’s typically large olives they are about to harvest. We step back and watch the action. A mechanical tree shaker is used to gently shake the trunk of the tree while workers use long poles to coax the olives off the trees into the netting below. This highly-efficient process continues from one tree to the next until each has been cleared of olives and the collection truck is full and ready to head back to the mill for crushing. It’s now time to venture off into the countryside as Saverio is eager to show us more of the area. We visit their lush organic groves which have been lovingly tended by the family for generations and then head for the hills. Saverio tells the story of the region’s most famous landmark where we are headed, the Castel del Monte, an octagonal citadel constructed in the 13th century by Emperor Frederick II which is now a World Heritage Site. This area of Castel del Monte is also a DOC wine region which we witness on the way to the castle as we pass acre after acre of vineyards. Most vines of this region produce local varietals such as the red, Uva di Troia, and Pampanuto, a popular local white wine. We notice many small rounded stone huts alongside each vineyard which, as Saverio tells us, were once used as shelter for workers during the harvest season. Arriving to the Castle del Monte is a magnificent site indeed and offers an expansive view for miles of the surrounding lush and fertile land. Smells of pine and herbs fill the air and one cannot help but think how such natural beauty must contribute to the unique flavors of the local olive oil. Pleasantly exhausted by the afternoon’s site-seeing, we head back to town for a classic Puglian lunch at one of Saverio’s favorite restaurants where we dine on fresh local fish, vegetables and homemade focaccia, all drizzled with Guglielmi’s freshly-harvested olive oil, and sip the afternoon away with a surprisingly delicious local red wine. With the afternoon light beginning to fade, we head back to the mill in town to see the results of the day’s harvest. Quite a different sight from when we first arrived in the morning, the mill is now full of olives which are heading straight to the crusher. As any skilled miller knows, the sooner the olives are crushed after picking, the better the quality of oil. Herbaceous and grassy aromas permeate the air as we watch the olives being crushed in their stone mill. Having the most modern production equipment is essential to producing an oil of premium quality and Olio Guglielmi bends no rules in this regard as all of the machines are top-of-the-line. After seeing the entire production process from beginning to end, our favorite time has finally arrived – a sip of the day’s fresh oil poured straight out of the tap. Tasting the resulting oil is nothing but pure tingling deliciousness on the palate and a joyful cough to the throat. This is full fruity pungency at its best – a true sign of an outstanding oil and years worth of hard-work paid off. Click to view our collection of Olio Guglielmi extra virgin olive oil.